Singer and actor Rain has been cleared of charges of embezzlement, according to the Seoul Central Prosecutors' Office on Thursday. A fabric manufacturing company had filed a lawsuit against Rain and executives of his agency J.Tune Entertainment in April, saying that they had suffered financial losses due to J.Tune's fashion affiliate J.Tune Creative. The plaintiff claimed that it invested two billion won in the fashion firm but that Rain and other shareholders of J.Tune Creative embezzled their money by falsely registering the company's stock assets worth 2.5 billion won and claiming Rain's modeling fees worth two billion. However, prosecutors ruled that it found the fabric company's accusation on J.Tune Creative falsely registering the company's stock assets as false and that Rain's modeling fees of 2.2 billion during three years was not excessive. Meanwhile, prosecutors indicted two officials at J.Tune for embezzling 900 million won of the firm's money used to acquire a larger stake in the agency. 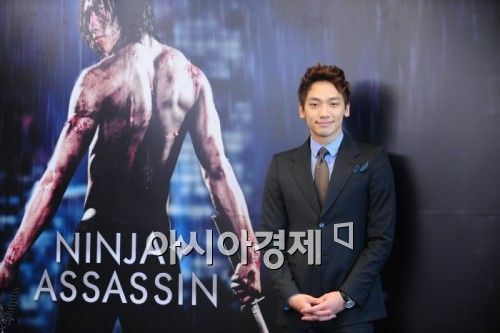 Rain, whose real name is Jung Ji-hoon, is considered one of the most successful Korean stars in the entertainment business. He has lead a popular singing career throughout Asia and has expanded his acting career into Hollywood, appearing in action film "Speed Racer" and martial arts picture "Ninja Assassin" last year. He had also been the largest shareholder of J.Tune from 2007 until July of this year when he sold off all of his shares in the company and instead recently asked his former trainer and producer Park Jin-young of talenthouse JYP Entertainment to take charge of the agency starting next year.